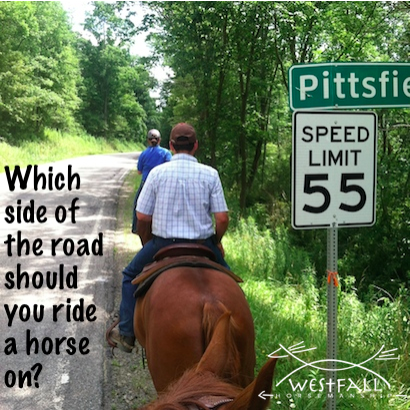 When riding your horse on the road should you go with the traffic or against it? “Stacy, When riding your horse on the road should you go with the traffic or against it? I feel better going against it as I do not like the cars coming up behind me right next to me. My girlfriend always rides with the traffic.” Priscilla B. The shoulder of the road and the traffic pattern often determines the answer. When I was growing up I did a lot of trail riding. Frequently we needed to travel stretches of road to get from one trail access to another and at other time we traveled for miles on the shoulder of the road to get from one point to another. We largely let the shoulder of the road and the traffic pattern determine which side we rode our horses on. Whenever possible we stayed on the side of the road with the largest shoulder or best ‘escape route’ if the horse were to become frightened. This was especially important when we were training new horses to be ridden around traffic. If their was a large grassy ditch on the north side and a guard rail on the south side we alway rode the north side no matter which direction we were going. Typically, if all things were equal we tended to travel in the same direction as the traffic. With new horses we rode sections of road that allowed us to pull over and watch the traffic as it approached. If the horse was nervous we also preferred to keep the horse busy rather than waiting to see what would happen. When I was a teen and first started riding my young horse on the roads she was very anxious around the big trucks, particularly the logging trucks that would pass by. The great thing about riding a horse is that you can hear vehicles coming often long before you can see them. If I heard a large truck I would get her busy by trotting circles in nearby fields or gravel turn off roads. This meant that as the rider I was very carful about which roads I would ride on until the mare became comfortable, and predictable, with the traffic. I chose only roads where I would have easy access to these ‘trainable’ situations. Once the horses were familiar with traffic it was often less intimidating to ride with the flow…unless the road was known for certain things. If there was a curve where people tended to ‘drift’ to the outside then we would consider switching sides. In this day, with all the drivers texting and messing with phones, I would be even more concerned about distracted drivers. Wherever you decide to ride; be careful, be careful, be careful. The driving world is more distracted now than it has ever been. Make sure you can control all parts of your horse and be sure that your horse is really ready for the challenge of the road. On a good day you will meet cars that are crowding the side of the road, driving too fast or not paying attention. On a bad day you will have people honking and blowing the horn, others yelling out the windows, or semis with tarps that are not secure and flapping as they blow past you at 60 mph. Some people WANT to see something happen…make sure your horse is broke so they don’t get that chance. A horse or bicycle in Maine should go with the traffic if my knowledge of the law is correct. In Pennsylvania it is a law to ride with traffic and horses have the right of way. I am in Texas and like to ride our lesser traveled paved road. There are wide, grassy easements in places, but steep drops to drainage ditches in others. I switch back and forth from left to right depending on the terrain, long-distance visibility, and my own comfort level. There are rocky places where my horse prefers the pavement to the easement. I am lucky enough to live in amish country where most people will slow down and go out and around horses, but not all. The barn where I board is along a main road and getting to the trails requires riding on this road. The first time I took my horse out on the road, a guy yelled out the window, honked the horn, and started driving right behind my horse on the side of the road. He unfortunately got the satisfaction of seeing my poor guy spook at that. After that, I made sure that my horse was as bombproof as I could get him before going out again. Now a semi, ambulance, fire truck, or motorcycle can go by and we have no issues at all. Luckily in Pennsylvania, the police are pretty good about letting us ride our horses into the city, on the road, and sometimes even through drive-thrus. Not without a high visibility half-sheet and vest, though! In the Netherlands, in law a horse is “a vehicle with 2 or fewer wheels” unless it is pulling a cart. You ride with the traffic, not on the bike paths, but otherwise, you are a vehicle. At night, the law says use lights/reflectors (white in front, red behind) and make yourself visible. Here in Kansas, horses and wagons drawn by horses or other animals are considered road vehicles. The riders or drivers have the same rights and responsibilities as someone in a motorized vehicle. (If you’re riding your horse from a bar, you can get a DUI, that’s why I take the dog too, and let him lead the horse and me home). You have to be aware of local ordinances though, since they restrict horseback riding. Other than that, anywhere except interstates, you follow the same rules as if you’re in a motor vehicle. Two things happened while I was out riding my horses. 1) A guy yelled out the window, ” You sure do have some pretty horses” right before he rear ended another car (no one was injured), and 2) a guy yells out the window “What’s the matter? Can’t afford the gas?” Little does he know that it costs about $200 per month to feed a hay burner let alone the medical expenses and upkeep. hahaha! But seriously, I’ve had motorcycles gun their engines, and semis use their air brakes deliberately trying to spook the horse thinking it would be funny. Didn’t work but still! I always figured that it depended on 3 things. Road, conditions, and the horse. Most horses I ride on the left if it’s a small road and there isn’t much shoulder. I try to keep the horse off of the pavement if at all possible and the further the better. The left side because depending on the horse and how well trained he is, most horses don’t like the sound of loud motorcycles coming up behind them, semis riding their air brakes, and things of this nature. My farrier and I also fight over the borium nails I use for their horse shoes. Borim nails keep them from slipping and sliding on pavement. Steel nails the horse’s feet will slide right out from under them like skating on ice, and that is at a walk let alone anything else. When I was in my late teens. A friend and I rode in my home town on the roads. We actually got pulled over by the township police and was told we have to ride with the flow of traffic. as possible, next to the fence or field edge. My sister and I always road facing the traffic, just as mentioned above, so we could see the cars coming and be aware of huge trucks that would sometimes BLAST the horn, just to get a good laugh …yeah, real funny!! We weren’t laughing. This is pretty much exactly what I do – let the road, traffic & horse dictate which side of the road I ride on. Now days, I mostly avoid roads. I started riding in upstate New :York. I was always told that the horse had the right away before a car as they were here first. A state trooper told us that If the horse was on the shoulder of the road and were hit, it was the fault of the horse and rider. He said to stay on the road ( which was dangerous ) and we had the right away. If the horse and rider were hit ( Heaven forbid ) they could sue. Of course, that didn’t bring back your beloved horse or help if you were killed. Here in Kentucky you take your life in your hands when on the roads, there are no shoulders on the back roads, and the drivers would just as well hit you as not, driving faster and honking their horns half way past you. The Amish have right of way and I always slow way up in either direction when I see them. A lot of places have extra areas where they can get off the major highways. Still not safe with the drivers now a days, on either side of the roads in Kentucky.